Do you want to teach social studies to students in grades 6 through 12 (Early Adolescence through Adolescence, also known as EAA)? Then this is your program. Social Studies program candidates participate in hands-on classroom-based field work with urban middle schools and year-round student teaching in urban high schools. 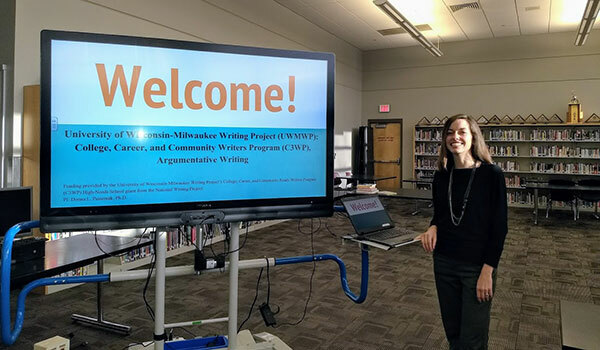 Candidates who satisfactorily complete the program requirements meet the Wisconsin teacher certification requirements for grades 6 through 12 (EAA). Why EAA Social Studies Education? The Social Studies Education program has a 100% pass rate for edTPA, which is required for licensure in Wisconsin. The most current teacher education curriculum taught by expert, experienced Social Studies educators. Quality field experience supervisors and exceptional cooperating teachers. Flexible and accessible course offerings, including evening, hybrid, summer, and/or fully online. Rigorous preparation for future employment in a variety of settings working with diverse groups of students. Perfect for a diverse array of students at different points in their careers: traditional undergraduates, transfer students, career changers who already hold a bachelor’s degree, and master’s degree candidates seeking a license to teach. Follow the steps listed in the Social Studies Education Undergraduate Program Application (PDF). Refer to the Curriculum tab for more information regarding the program and admission criteria. Follow the steps listed in the Social Studies Education Post-Baccalaureate Program Application (PDF). Refer to the Curriculum tab for more information regarding the program and admission criteria. Refer to the Curriculum tab and please contact Dr. Jeffrey Hawkins, Program Chair and Associate Professor for more information. See C&I Master’s degree program. Candidates who already hold a bachelor’s degree can earn their teaching certification by successfully completing the EAA-SS post-baccalaureate teaching certification program. It’s possible that coursework completed as part of your bachelor’s degree could be applied towards our program. Please complete the web form below to find out if any of your previous course work can be used to fulfill certification requirements. Please contact Dr. Jeffrey Hawkins, Program Chair and Associate Professor for more information. See C&I Master’s degree program. Questions about the Undergraduate or Post-Baccalaureate programs and/or admissions? Dr. Hawkins scholarly research includes a line of inquiry that reviews culturally responsive curriculum materials via content analysis academic research in addition to observing culturally sustaining teacher preparation and practices in the P-20 classroom via practitioner research.